Right now many churches are simply emailing a copy of their printed newsletter via email. They save the PDF, upload it to an email and click send…and maybe on a good day they’re actually copy-pasting the announcements into an email. Today we’re going to help you turn the ship around and get sailing in the right direction and show you what makes a great email newsletter that people want to read. There are people in this world that earn up to $100,000 a year to write emails. Regardless if you read these email or not, other people do. So don’t immediately dismiss the professional emails sitting in your inbox. Instead of trying to break the cycle or be original, study what emails come to your inbox and the ones you spend time reading. You’re reading these emails, and so are hundreds of thousands of people. So most likely, your congregation would read similar emails too. Take those emails you like and model them. Don’t copy their email verbatim, but find what you like about their email and try it in your own church email newsletters. Maybe an email you like only has 1 announcement per email, so try that on your own. Instead of church email newsletters with 10 announcements every week, try one email with one important announcement. Before you call off your email strategy, try something different. What Is A Good Church Email Open Rate? Imagine a Pastor announces to his 200-person congregation that there’s a potluck, and then only 50 people came. Would you come to the conclusion that stage announcements don’t work because only 1 in 4 people showed up to the potluck? It’s the same with email. Just because your open rate is only 25% doesn’t mean that no one’s paying attention. In fact, the average open rate for religious organizations is 24.77%! So if you can get at least 1 in 4 people reading your church email newsletters, you’re actually doing good! Does How Many Emails You Send Make A Difference? No matter how often people email you, you’ve probably determined whether or not you’ll open their emails. There’s one email marketer both Dave and I love, Ben Settle. And he emails at least once a day, sometimes twice a day! And we open every single email because he’s entertaining and provides a lot of value in his emails. There are other companies that email us only once a week or once a month, and we still never open their emails. Are there people in your own inbox you know you’ll never open their emails? And are there people you’ll open every email they send? The point is this. The amount of times you email your congregation is not the determining factor of success. 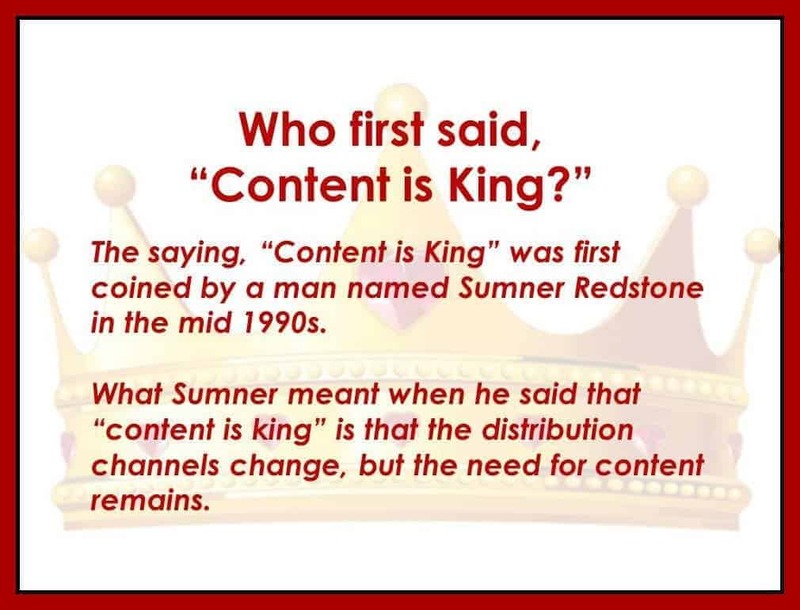 “Content is king” when it comes to getting people to open emails. If you’re emailing a digital copy of your already printed newsletter or bulletin, that’s why no one’s reading your email. There’s literally no extra value inside. They already know what’s inside of it. But if you can send an email that has value inside and improves your congregation’s life, you can send as often as you want and people will read it. Now, depending on who’s sending the emails, it can take time to develop a valuable email. So if you can only provide a valuable email every two weeks, then only email every two weeks. If your pastor has a devotion or daily musings that he/she can share every day, then go for it and see how it performs. Every church send-rate will be different, but there is one theme that maintains the same throughout. To get you started on creating valuable emails, here are my top 3 secrets to creating more valuable emails that people will jump to read. When I was in college, I got emails from my church that included information that had nothing to do with me. I was told about a women’s conference I didn’t want to go to, a camp for kids I didn’t have, and a senior game night I wasn’t invited to. These emails provided zero value to me, so of course, I stopped opening them. So to make sure that emails land in the right inbox, make sure you segment your email list. Tag people on your list with qualities like parent, woman, male, senior, etc. Then in your email platform, only send emails that apply to those people. Instead of blasting out information about the youth parents people, just send an email to “parents…” or better, “parents of youth.”This takes some setup on the front end but your recipients will be grateful, and people will finally start to hang around and open your emails. 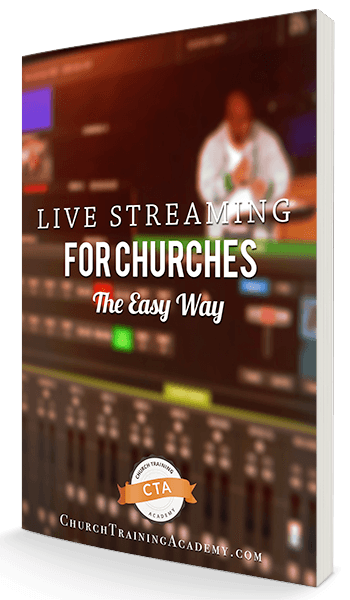 Many of the popular church management systems can already do this. Fellowship One and CCB can segment your membership database into ministries and groups so you can email one group at a time. And of course, all the popular mail apps are able to do this as well. Well, guess what, email is the same. No one wants to be talked at or preached to in an email. So don’t do it. Email is unlike social media blasts because it can turn into a one-on-one conversation. In your inbox, it’s just me and you. Unlike social media, when I consume an email I’m consuming it personally. So don’t just give me the details about the event, inspire me to come. Make me laugh, make me say “awww,” and make me desire to go. Inspire your recipients to take action, not to take a nap. 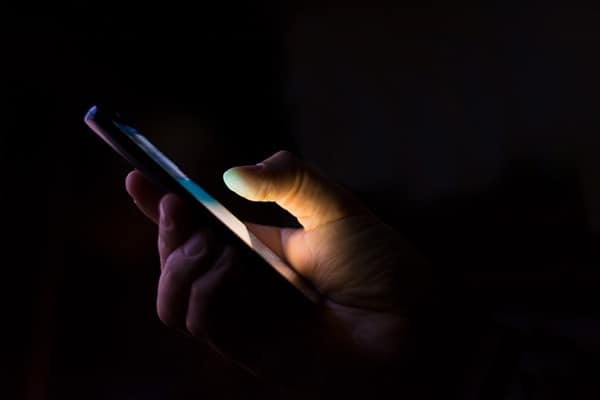 When we had Billy Taylor on our show talking about the power of email, he spoke on how your emails can be a source of connection to your church. Billy shared how one Super Bowl Sunday, he emailed asking for prayer requests. To which he was overwhelmed with responses. Your church email newsletters can do the same. Take a break from the announcements and give encouragement, wisdom, and guidance. When life gets stressful and a church member falls away from attendance, a mid-week email is another way for them to stay connected. And instead of them only getting fed and encouraged on Sunday mornings that they miss, a Tuesday email can speak into their lives and provide a light they desperately need. And for the people that do come on Sundays they’ll continue to build a deeper relationship with the Pastor in emails throughout the week than the few minutes of face time a month they might get on Sundays. Email marketing for churches isn’t about finding a magic bullet. It’s about providing valuable information and relationships throughout the week. Remember that people don’t automatically open every email they get. They’re looking for value. So if your congregation isn’t opening your emails, it’s because they don’t find value in what you’re doing. Don’t blame the platform, just change up how you use it. Only send emails to the people they are relevant to. Segment your lists so every email directly applies to the recipient. And use email like you hear how you should use social media. Don’t blast info at your audience, give them something valuable and memorable. Tell stories, be funny, share revelations and insights. Ask yourself, “is this something I would read?” And if not, don’t send it and write a different email! What does your church email newsletter look like? Share in the comments below! We couldn’t cover everything in the podcast. In fact, if we tried to cover email marketing as a whole we’d be talking about nothing but email for over a year! So we’re putting together a special course to teach everything about using email for your church. But we need to know what your #1 burning question is about email marketing for your own church. Fill out our single-question survey and you’ll get an advanced copy of our next resource, “5 Emails Your Visitors Will Love” AND you’ll be entered in for a chance to win our email course for free! 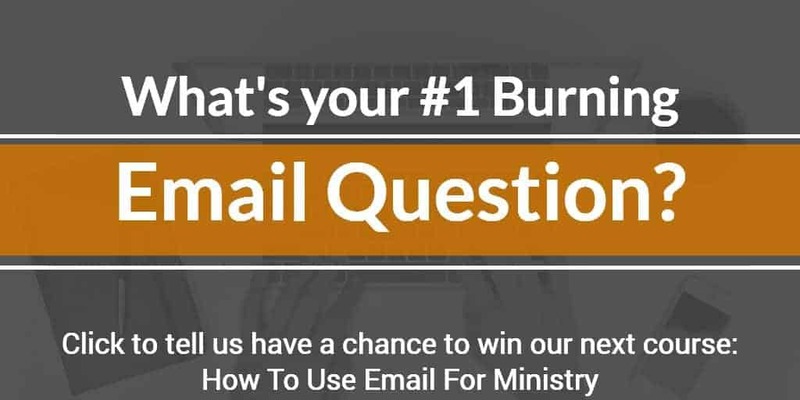 So let me know, what’s your #1 burning question about using email for the church?